Discover the way the local Panamanians enjoy the country. Taste, touch and listen to the real Panama. you will get a completely new feel for the country as you discovery everyday life. Learn about the culture and support the locals by buying local products. A truly local experience in the heart of Panama City The Mercado de Mariscos is the city fish market, open for business to local restaurants and the public every day except the 3rd Monday of each month when it is closed completely for thorough cleaning. It’s the best place to buy fresh fish in Panama City – everything from tuna to snapper to lobster to octopus – or ceviche to go from one of the many vendors. It’s bustling with energy as local shoppers mingle with tourists to inspect the day’s catch. On the outside of the market you find numerous small stalls selling Ceviche (a Panamanian specialty made with fish cured in lemon juice) and some other typical seafood dishes. Join the crowds for lunch with cup of your favorite type of fresh cold Ceviche or seafood cocktail, or head upstairs to the casual restaurant where you get a variety of typical Panamanian seafood dishes. If you are looking to observe sea turtles and sea turtle nesting Panama is one of the most popular places in the world for this. 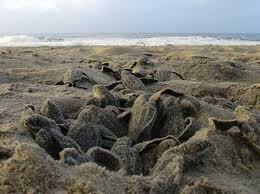 Four species of marine turtles are known to nest in the Bocas del Toro Archipelago only. The leatherback (Dermochelys coriacea), hawksbill (Eretmochelys imbricata), green turtle (Chelonia mydas) and loggerhead turtle (Caretta caretta), that can be seen in different seasons during the year.